11/10/2016 · The option “Get Parameters Values From” applies the parameters from one column in the provider Web Part to a column in the consumer Web Part. 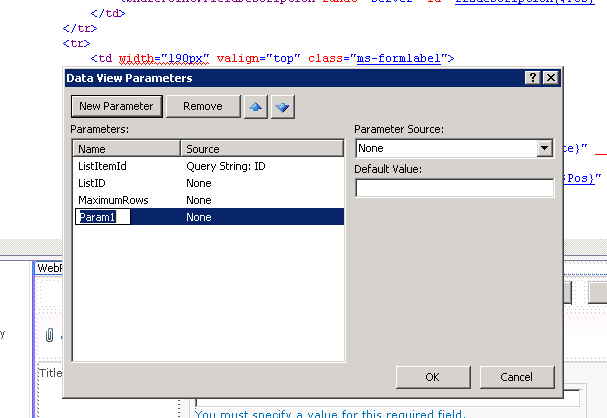 To be able to use this option, the web parts need to have parameters configured.... - We can use URL parameters to filter sets, we first need to create a calculated field based on the Set such as IF [SetName] THEN 1 ELSE 0 END and then the URL parameter would use the name of the calculated field. I haven't tried this with the new v10 ability to use ad hoc groups in calculated fields but I expect it would work the same. 27/11/2013 · I am having issues with how to pass parameters when doing a query/get to a function. The function is Called Get-MyUser in the relative path MyUser and it has a Parameter called Username. Calling without any parameter works just fine, it is with a parameter it doesn't work for me. 16/12/2009 · Hi, I have report on CE 10 where I need to pass parameter using url. Also is there any way I can pass user name and password in the URL as well. Or maybe there is a way to set up report in the CE so when it is executed CE doesn't prompt for password. 11/10/2016 · The option “Get Parameters Values From” applies the parameters from one column in the provider Web Part to a column in the consumer Web Part. To be able to use this option, the web parts need to have parameters configured. The function then reads the URL of the current page and sees if there are any parameters specified in the URL, it will generate an alert stating the value of the parameter ‘category’. Instead of generating this alert box, you can perform whatever action you want.